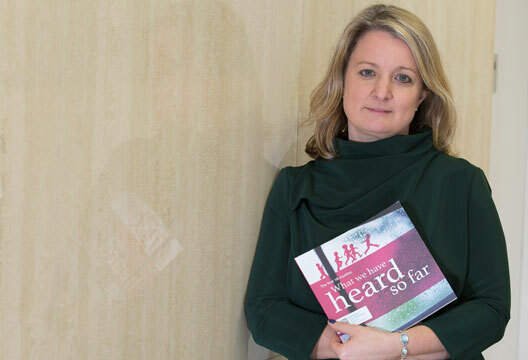 For many years those who spent time in the institutions of Scotland struggled to have a voice, particularly when silenced by abuse and maltreatment. Following determined campaigning by those with lived experience, Scotland now has a landscape of national initiatives that give voice to those looked after away from home. The National Confidential Forum holds a unique place in this landscape as an acknowledgement forum; we hear testimony and accept without challenge. While those who come to the Forum remain anonymous, their histories are remembered. The Forum sits alongside the Scottish Child Abuse Inquiry, which begins public sessions for survivors on 28 November. After many years working therapeutically with those who experienced abuse and trauma in childhood, I took up the role as Head of the National Confidential Forum. The Forum was established as part of the Victims and Witnesses (Scotland) Act 2014 to hear the testimonies of those placed in institutional care as children in Scotland, including any abuse they may have suffered. The Forum is open to those over the age of 16 who have spent time in a children’s home, a residential unit, a residential school, an NHS facility, a boarding school, a secure unit or a hostel school. Testimonies are most commonly given in a two-hour hearing although some have chosen the option of two sessions. Others have given a written testimony, which is read aloud and witnessed with equal respect. It doesn’t matter how long the institutional stay was, or when the person left. Being heard on a national level plays a unique part in the transformative change that is shining a light on historical abuse; experiences many have felt were unspeakable in the past. A petition raised by one individual in the Scottish Parliament stemmed from the determined work of a small group of survivors of abuse in care who were reaching out to others with shared experience. This petition drew Scottish Government attention to institutional child abuse and the need for an inquiry and unreserved apology. It followed escalating concern throughout the 1980s and 1990s about the quality of residential childcare in the past and growing awareness of historic abuse more generally. In 2004 Scotland’s then First Minister, Jack McConnell, apologised on behalf of the people of Scotland. The apology was the catalyst for a range of initiatives to address the needs of those who were abused in care in Scotland. As part of that landscape, the Forum was established to acknowledge people’s experiences. Whether those experiences are positive or negative, our focus is solely on what people tell us, in their words. People are not questioned or probed, nor are they asked for more than they are willing to give. We hear their stories and accept them without challenge. This is about their truth. By taking part, each person is contributing to a national record that will provide a basis for learning. The more voices added to that record, the stronger our collaborative contribution to prevention and response approaches will be. For many people who have spoken to the Forum, it is the first time they have ever shared the details of their life in institutional care, particularly the experience of abuse and cruelty. Some have tried to speak before, but have been faced with denial, resistance or distortion. The anonymity we offer can be a way for people to speak out yet feel safe. Through our reporting of patterns and themes, and capturing of personal narratives, the childhood histories of those who attend the Forum will be remembered. Their voices will be amplified; public knowledge and understanding of this period of care should be enhanced. We have a responsibility to report annually to the Scottish Parliament and meet with the Scottish Minister for Mental Health. Since our first hearing in February 2015 we have heard from over 100 people. Our first 18 months of work was captured in a report for participants called What We Have Heard So Far. It paints a picture of childcare that in some ways might seem alien now. Many of the testimonies describe family, school and institutional life in post-war austerity and the early days of the welfare state. The level of emotional neglect was high and punishment was routinely severe. In these narratives are themes that will resonate with psychologists across many fields; within many of the testimonies, relationships are key. Some have spoken of positive, warm relationships that saved them from poverty and abuse in the home, of people who went the extra mile, and of small acts of kindness that were remembered for a lifetime. Sadly, most of those we have met describe physical and emotional abuse at the hands of those who were trusted to look after them. The life-long impact was felt acutely in testimonies that described care experiences that were cold, punishing and for some highly abusive; perpetrated by a single abuser or part of a regime of punishment across an institution. We met people who have carried the burden of abuse in care well into adulthood, shaping every aspect of their lives from education and job prospects to relationships. Testimonies reflect childhoods in which individuality was denied, stigma and marginalisation were ever-present, and humiliation was commonplace. Others described institution-wide, pervasive sexual abuse that created environments where love and affection were conditional on abuse. a sense of what it was like to leave care, when transitions were felt to be accelerated and abrupt. Many testimonies captured the perpetual experience of grief; be it loss of family, children, of important staff members or the homes themselves. Many testimonies cited confusion and instability during care that occurred against the backdrop of an early history of abuse and loss, often accompanied by parental alcoholism, attachment trauma and neglect. Descriptions of life after poor care experiences in the institutions of Scotland in the past reflected a sense of perpetual survival in the face of ongoing crisis. Long after they had left, people described feeling disadvantaged by circumstances outside their control, which served to exacerbate feelings of isolation and powerlessness. Going forwards the Forum is committed to identifying themes and patterns to input into policy and practice; many of those giving testimony have been driven to do so to ensure what happened to them does not happen to other children. Despite the changes in the social context of care from much of the historic testimony that contributed to What We Have Heard So Far, outcomes for care-experienced children and young people remain poor. Scottish Government statistics reveal those leaving care are over-represented in the homeless population and are more likely to experience formal exclusions from school, with 73 per cent leaving school before 16. In Scotland, a third of young offenders have a history of care, with 31 per cent of adult prisoners reporting care experience. The unique set of life circumstances of those with a history of care mean they are dealing with challenges that exacerbate disadvantage. Many are coping with the impact of early trauma and living with associated mental health concerns. Coping strategies such as self-harm, anger and suicidality, alongside unstable placements and understandable issues around trust, all create barriers between young people and the help and support they need to reach their potential. Through maintaining a clear connection to the lived experience described in the hearings, a number of which have taken place in Scottish prisons, theoretical concepts will guide how to make maximum psychological sense of what we hear at the Forum to aid understanding of the links between a poor care experience and offending, homelessness, and unacceptable economic disadvantage and ill-health. As a society we need to make sense of how children and young people can remain unseen even in environments where they are placed for their protection. Those giving testimony have asked why adults did not act when children were experiencing abuse, exploitation and dehumanising treatment. Psychologists have a unique contribution to make to this discourse as many have met those struggling with the life-long impact of early trauma and abuse in clinical practice or as part of specific studies. However, more recently we have seen that engagement taken to a new level with, among other initiatives, the powerful personal narrative of Danny Taggart in the October 2017 issue of Clinical Psychology Forum, when he spoke about his own experiences in care. The British Psychological Society has also taken steps to improve responses to disclosure, recognising the profession’s duty of care to clients and in the safeguarding of others, with the publication of the 2016 guidance document on the management of disclosure of non-recent (historic) child sexual abuse and the establishment of the Society’s Safeguarding Children and Young People’s Group. There is also a wider contribution we can make in applying psychological knowledge and skills to the understanding of how systemic dynamics affect individual circumstances. Through listening to testimony, we have heard adults speak of how their belief systems were shaped as children by the abuse itself and the circumstances surrounding treatment. When institutions or responsible adults failed to make abuse stop; if the response to disclosure was punishment or disbelief; if a child was moved or valued opportunity lost; if a perpetrator was seen as too important or too valuable to be investigated; all are internalised by the child and those in the vicinity. The abuse serves to maintain wider control and silence others. Through testimony, we have witnessed descriptions of the depersonalisation and devaluation of children – rendering them invisible by stigma. Organisational actions and culture have the power to challenge maltreatment. All too often we have heard instead how they confirmed self-blame and hopelessness, perpetuating the potential for further victimisation. The Forum is a unique opportunity to have policy and practice embedded in the expertise of those with lived experience. Through careful listening and qualitative analysis we hope to learn more about the life-long impact of care experience, how to help those struggling to cope and how to prevent abuse and support disclosure. Culture has a significant role to play in moving the focus of responsibility away from the child to speak up. Our participants believe that the optimum atmosphere for safety is rooted in strong, safe relationships that challenge isolation and shame. Well-trained, supported and screened staff members need to be embedded in a fully informed culture confident around disclosure. If systems are able to broaden their understanding of how individual workers and entire organisations can be groomed to maintain secrecy, this will contribute to an atmosphere in which children and adults alike will be listened to and all learn that nobody is indispensable. Challenge to the organisational denial of the reality and scale of problems, and the myths held about both victims and perpetrators, sits alongside clear channels of reporting, good coordination and meaningful monitoring. Combined, these issues could contribute to the creation of a public health response that is able to meet the challenge faced by society. Psychologists understand the power of talking and listening, of having someone bear witness to experiences that have been carried and hidden through shame or disbelief. Being heard and acknowledged is vital. That’s the underlying principle of the Forum. Our members and support team work concertedly to ensure participants feel safe and supported from beginning to end. The process is guided by attachment theory and trauma awareness, and the impact has the potential to provide a healing effect. We have travelled to people throughout the UK, including supporting people internationally to have their voice heard. At the Forum, gathering testimonies is an ongoing process, alongside analysis and understanding of what people are telling us. As a profession, psychology must continue to improve awareness among practitioners and review practice and clinical decision-making in this complex area. Our knowledge, skills and experience place the profession in a unique position to lead on evidence-based policy development and sensitive practice improvements. Don’t look away: be heard, make a difference. - We invite all people who have experienced residential care in Scotland to think about giving their testimony to the Forum, independent of where they live now. Visit www.nationalconfidentialforum.org.uk or call free on 0800 121 4773. If you would like to know more about our work or feel your research interests are relevant to the Forum, or you would like to support someone else attending the Forum, get in touch.